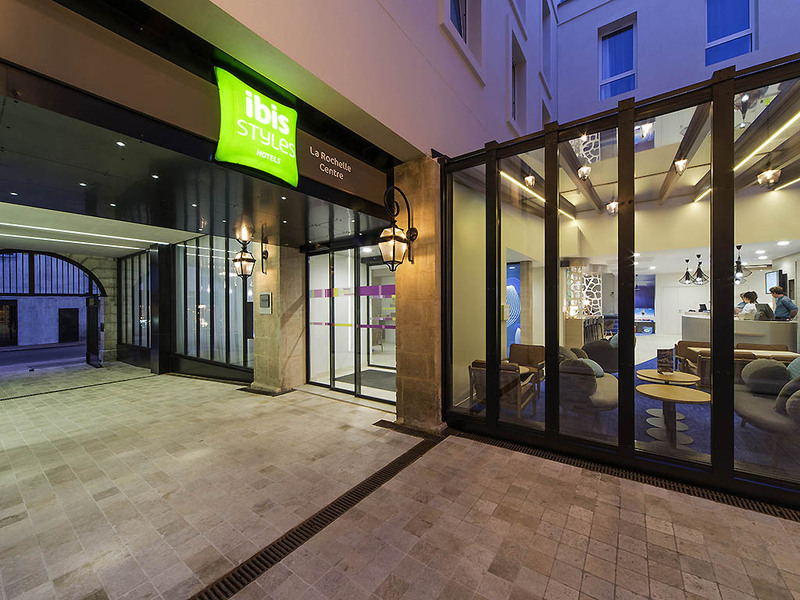 Breakfast and unlimited WIFI are included in all rates at the ibis Styles La Rochelle Centre. The hotel is located in the heart of La Rochelle near the Grosse Horloge, the Old Port, and Casino beach. You are just 109 yds. (100 m) from the ferry terminals for Îles d'Aix and Ré. The hotel offers 82 air-conditioned rooms. There is also a bar with 24-hr snack service and a paid car park 400 m away (437 yds). The rooms are OK, but need more storage and The heating/air con didn't work well. The breakfast was good but why are most of the table and chairs in the dining room so low, and it could do with more tables! The bar is a bit pricey and seats are ridiculous and uncomfortable. The Free drink for no room service is a great idea. Very friendly reception and interesting decor in corridors and rooms. Usual good selection of breakfast items, but found some of the seating in the restaurant inappropriate. Good shower and clean bedroom, but bathroom rather small (although receptionist told us that we could have been moved to a larger room if we had asked. We will know next time. Really good location in hotel that we previously stayed in during 2001 when it was just Ibis. New decor extremely interesting, but our 3rd floor room was rather small, particularly bathroom. Good friendly service from Reception. Welcoming helpful staff relatively easy parking in Place Verdun but with cases need to ofload at hotel before parking. Good breakfast and open hours good for early or late travelling. Comfortable modern room. All ok except walk from public car parking was a pain. Room way too small! An enjoyable stay overall. The hotel is very conveniently placed for getting around the centre of La Rochelle and is reasonably priced. The rooms, though small, are comfortably furnished. The breakfast buffet was quite varied. Clean room , clean bed , friendly staff. I always choose Ibis styles when in La Rochelle , location excellent and has all I require for my stay.., Will be booking again shortly for February and March stays ! If I had one reservation it would be the bath towels , they really could be a bit thicker and would be so much nicer to use ,.otherwise no problems. Good location and reasonable choice of breakfast included. Problems with room heating which would not be a problem in the summer. Helpful staff and clean room ideal as a based to explore the area. Hotel room was clean, bed very comfy and great breakfast. Hotel itself was very central. Room was a bit noisy from the harbour front at night - La Rochelle was having a party! As normal I was overall happy with service , room and of course location ., not over keen on room 412 ( next to lift ) but have already booked next stay. Staff are extremely efficient and helpful. The breakfast is also delicious and there is a good choice. The hotel could not be more convenient, near the old port and shops. Superb location, quiet clean and comfortable room, excellent breakfast - good value all round! Parking was the problem being disabled and receiving an email in French telling me the parking that was on site when booking was now 600 yds away, only the day before arrival was very bad. I would have cancelled! I enjoyed my stay in the hotel, room was a little small but adequate, I'm not a fan of one shower soap dispenser for everything, bed was comfortable, room decor cleanliness was acceptable. Nice room, intimacy between kids and parents, very good location, the kids loved the baby foot area. We appreciated the daily baked patisserie for breakfast.